THE Eastern Mindanao Command (Eastmincom) of the Armed Forces of the Philippines belied abduction claims of the militant group, calling it as “malicious, illogical and cheap gimmick” aimed to discredit the Army’s effort in winning peace in its area of responsibility. This developed after a certain Meggie Nolasco, executive director of Salugpongan Ta’ Tanu Igkanogon Community Learning Center (STTICLCI), accused soldiers of 71st Infantry Battalion (IB) were behind the abduction of a certain Imelda Hayahay in exchange of P5,000 or the surrender of her daughter Jeany Rose Hayahay. Imelda is the mother of Jeany, a teacher of STTICLCI. “Abduction is a criminal offense more so that the abductors are asking for a ransom for the release of the abducted person. Such a practice is not being tolerated in the military service. Any military person who is into the said practice is subjected not only in the military justice system but also to the criminal justice system,” Eastmincom Lieutenant Colonel Ezra Balagtey said. Based on the statement of Anakpawis Party-list Rep. Ariel “Ka Ayik” Casilao on Monday, he called on the military to release Imelda, 53. Hayahay was supposedly taken in Compostela Valley last October 15 at Purok 1, Star Apple, Barangay Pindasan, Mabini in Compostela Valley. Balagtey even challenged Nolasco to file formal complaint should there’s an evidence that will prove that the soldiers are really behind the disappearance of Hayahay. “Our doors are open to any third-party/interagency investigation to ferret out the truth about her disappearance. At the moment, our unit will be in coordination with the Philippine National Police and the local government unit of Mabini, Compostela Valley to locate Imelda Hayahay,” Balagtey said. 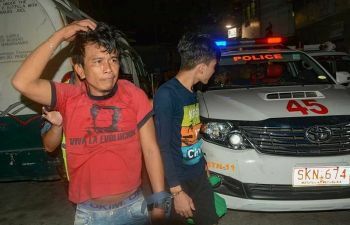 In a separate statement, Mayor Reynaldo Dayanghirang of the Municipality of Mabini sided with the military, saying they were not responsible for the alleged abduction.